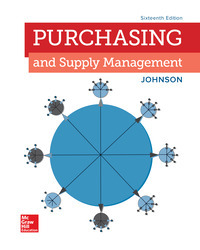 Purchasing and Supply Management provides a comprehensive introduction to the purchasing and supply chain management field, supported by over 45 case studies. The text focuses on decision-making throughout the supply chain. Connect is an easy-to-use homework and learning management solution that embeds learning science and award-winning adaptive tools to improve student results.